Saudi Arabia and the United Arab Emirates that make up GCC – are committed to form a common framework for the introduction of value added tax (VAT) in the region. In order to achieve conformity within the GCC, it is anticipated that the six member states will all aim for implementation of VAT during the period commencing 1 January 2018 or by the end of 2018 (The Governments of the Gulf Cooperation Council (GCC) – Bahrain, Kuwait, Oman, Qatar – status unknown due to GCC politics/friction). VAT as a process will affect many aspects of businesses operating in the GCC and will require significant time to plan, and integrate into existing processes. Based on above objectives the PDF document ‘More detailed description of Work in booklet‘ established the scope, schedule and means of initiating the work to be performed by the service provider and describes or references the specifications, instructions, standards, and other documents, which the service provider shall satisfy or adhere to in the performance of the work. Design a Business Blueprint outlining the implementation of VAT in SAP and supporting systems. Develop this blueprint through understanding and incorporating the GCC VAT law, Client’s VAT strategy, detailed business requirements and current system landscape. Implement the blueprint in conjunction with the Client’s IT team, including testing, training, documentation and go-live support. Develop the appropriate reporting for compliance with GCC VAT between Client’s SAP system and government authorities. 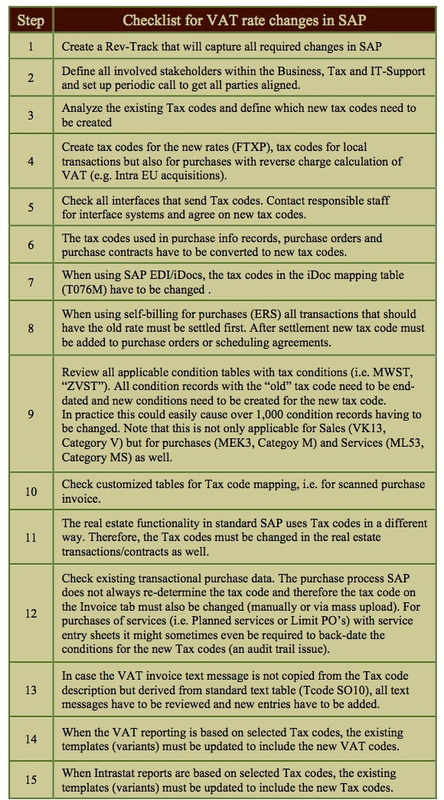 As a Standard SAP tax code consists of only 2 characters, the number of possible tax codes is limited. Numerous companies use a considerable amount of tax codes and risk facing a “shortage” of the necessary tax codes.